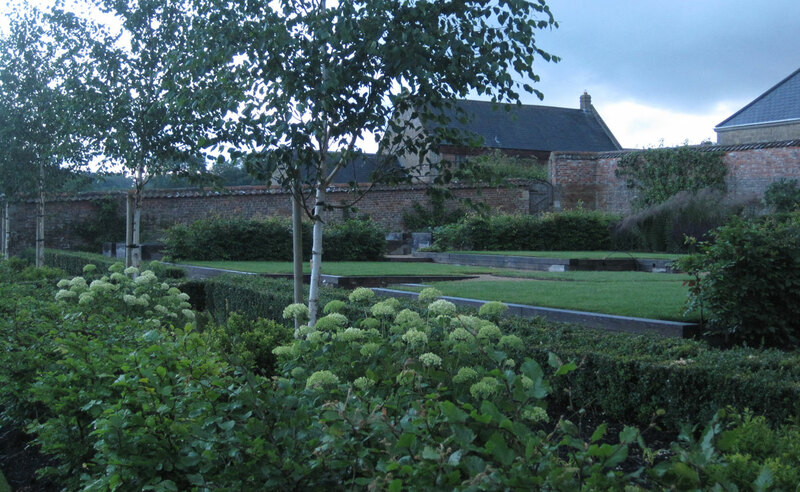 This has been a long running project which began with a design for the walled garden which was implemented a few years ago and, more recently, a design for the front entrance and visitor parking. 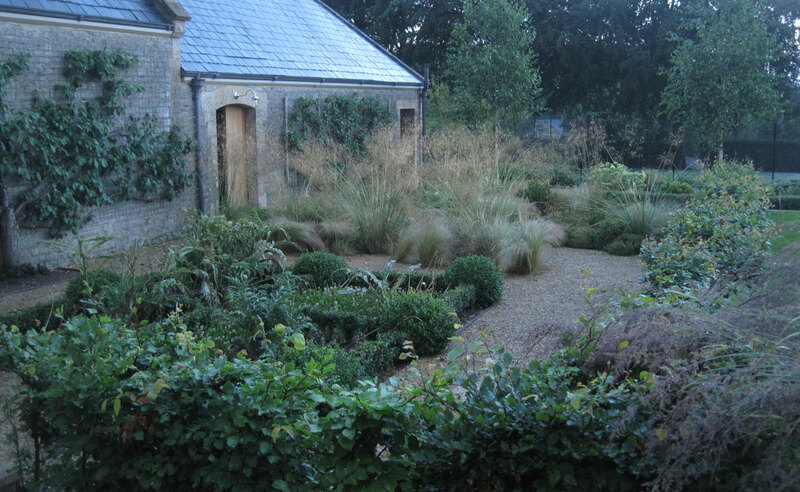 My clients wanted a clean and unfussy space for both garden areas which allowed me to play with space and form, using both hard and soft landscaping to create a 3-dimensional sculptural design. The manor is built from local Doulting stone, which is a honey-coloured stone similar to Bath stone, which is mainly too soft for garden use. 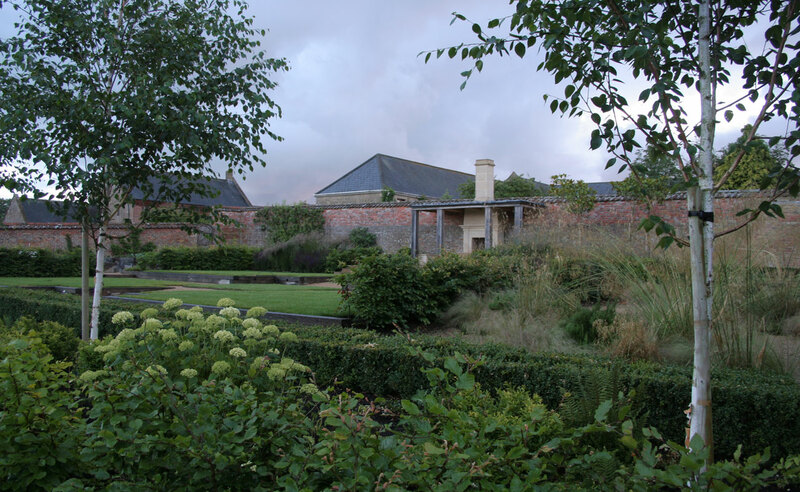 However, by using harder stone quarried from deep beds we were able to construct the major garden elements, such as the wide terrace steps, from solid blocks, giving the simplicity to the scheme that we were all after. Within the terrace my clients also wanted to install an outdoor fireplace, with inbuilt stone seats, so that they could enjoy the garden all year round. 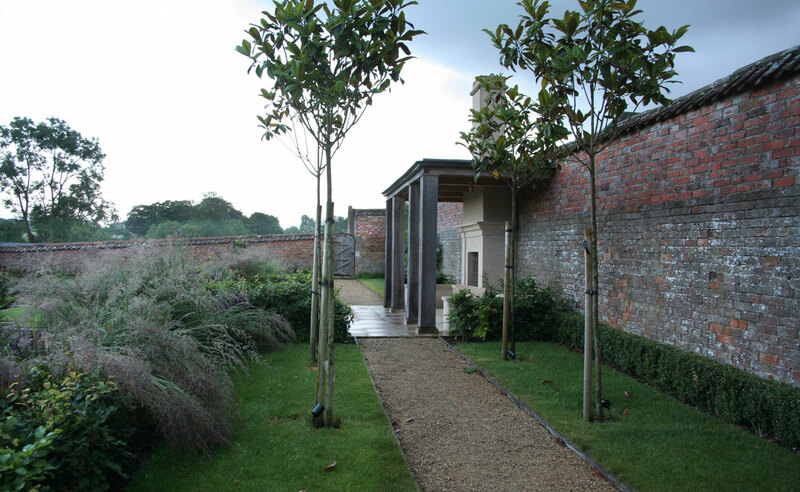 This required Planning Permission and Listed Building consent which I obtained for my clients, despite the unusual nature of the design, and I then worked in conjunction with stonemason Robert Neave to design the detail. 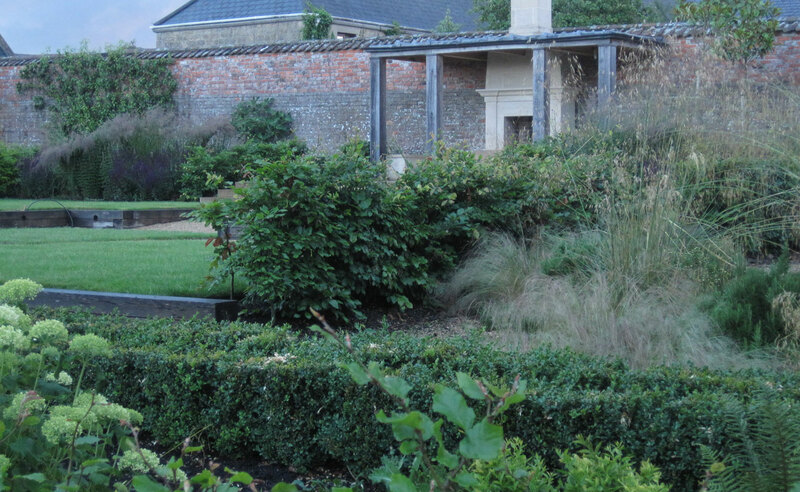 In addition to the stone elements, I used lengths of beech hedging to enclose the central areas of the garden, creating a sheltered terrace against the north wall of the garden where the fireplace is located, approached from either side by a wide grass-lined path. 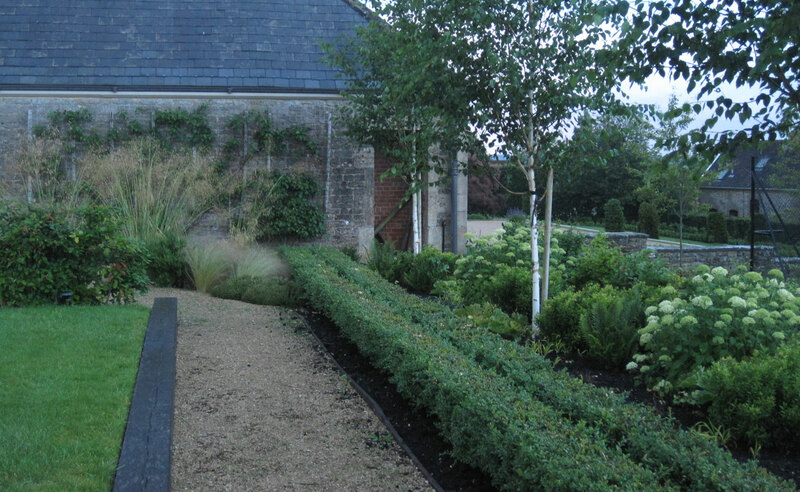 Between the garden and the existing tennis court adjacent to it, new birch trees are regularly spaced in front of a beech hedge, underplanted with large drifts of textural groundcover, including Sarcococca, Epimediums, ferns and low growing ornamental grasses. 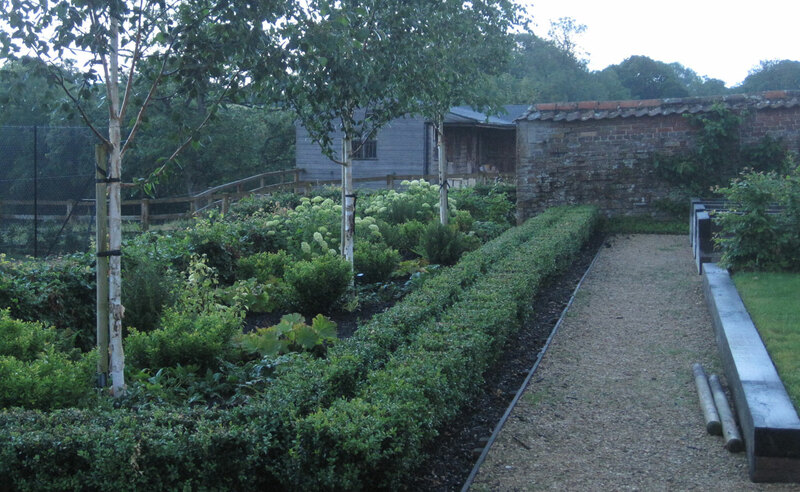 A double row of tightly clipped box hedging creates a neat finish on the garden side. The new entrance area sorts out a narrow drive and lack of both visitor parking and turning space. The house sits sideways to the drive, and has a slightly awkward asymmetrical facade and the new design helps address some of these problems. 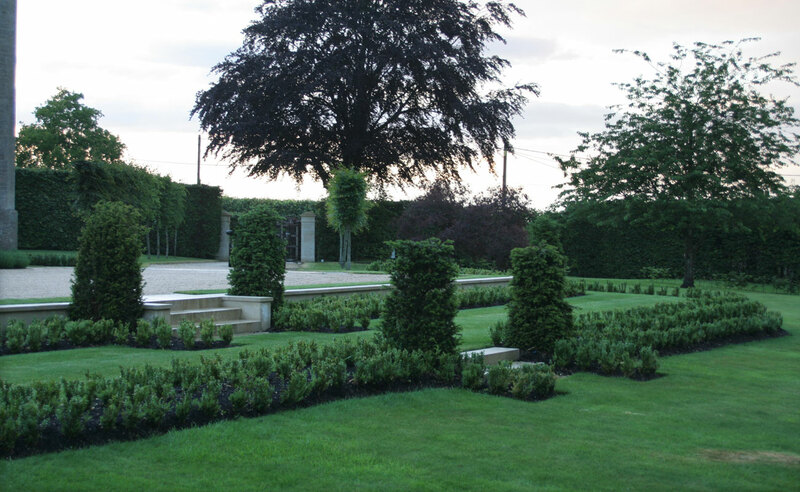 Levels also needed to be raised to create a large level space, where deep rows of clipped box, yew and lavenders provide soft structure and height, and a series of parallel paths now link the various elements of the garden. A small clipped box feature is designed from the window patterning and creates a visual feature to balance the asymmetry.